Little Passports is a monthly subscription educational kit that follows fictional characters Sam and Sofia on their exciting travel adventures around the USA and the World. They inspire a love and understanding of the World as kids learn about a geography, history, culture, and language in a fun and memorable way! There are two monthly subscriptions: the USA and the World. We chose the World edition as my kids are very eager to learn about different continents and countries. In the World edition, every month, Sam and Sofia embark on a new country adventure. Country specific packages filled with fun souvenirs, letters, stickers, photos, activity sheets and more arrive every month. The first package we received was an introductory package that contained a suitcase for my kids to keep, filled with goodies. What’s in the Little Passports Suitcase? The suitcase became the object of interest for my 5 year old almost instantly. He couldn’t wait to open it and get his little hands on what’s inside. An introductory letter from Sam and Sofia, the fictional tour guides, explaining about the program, and the suitcase. My 8 year old had to read the letter to his brother, since it was a bit complex for my younger reader. A Boarding Pass. It provides a secret code -the login information to access the Boarding Zone, an area on the Little Passports website that has interactive trivia, games, maps and puzzles. The Boarding Zone has activities specific to the country or state your kids are ‘visiting’ that month. A world passport which my kids adopted adding their photo and details about them. The passport keeps track of the countries they ‘visit’. An activity worksheet that uses a cipher to help your child figure out how to greet people in 5 different languages, an activity explaining and practicing how to find the country capitals on the map and an introduction to flags of different countries. 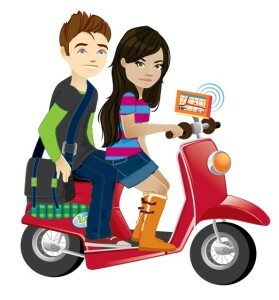 An image of Sam and Sofia in their aunt’s garage showing off their GPS-enabled scooter. Two stickers with Sam and Sofia images. My younger son attached them to the suitcase. What can kids learn from Little Passports? 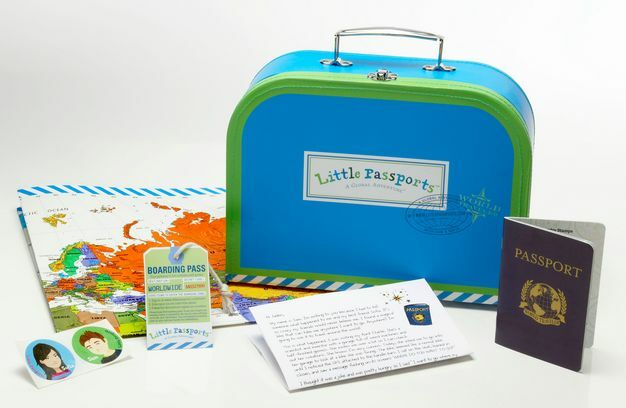 The Little Passports monthly adventure kits address the learning needs of basic math and reading skills, the unique approach of taking kids on virtual travel also allows them to explore Social Studies skills. First and foremost it teaches kids geographical awareness. It’s an important aspect in child development. I catch myself more and more telling my kids about other countries, people and cultures. The way of life and other interesting facts that are very different from the ones here in America. I was very excited to discover Little Passports that helped me a great deal in teaching my kids. The large World map provided by the kit is a great tool for kids to learn how to read and understand maps. It’s big enough to read the names, pin point countries and cities of interest and even make notes on it. We’ve started to put pins for every country one of us visited to see if we can cover it all one day! It’s also a great opportunity for me to introduce arts and crafts from all over the World to my kids. As we go from one country to another I find different culture related arts and crafts and let my kids try it. For example, origami that we made so many times is a perfect example of Japanese craft. We were able to discuss and try more origami when we ‘visited’ Japan. What’s the Target Age for Little Passports? Little Passports markets their subscriptions for ages 5 to 12 years old. I have two sons age 5 and 8 and so far both of them are very excited to explore the contents of each package. We do it all together and I try to explain to my little one if he gets a bit confused along the way. Final Thoughts on Little Passports. Little Passports is a fantastic activity to do with kids. It provides such fun learning and exploring. This is a great opportunity for kids to experience the World virtually first hand. Thank you team for letting us try the product. We are definitely on board!